Think of the mosquitoes these bats can eat! In the early 1980s, the city of Austin, Texas needed to enlarge its Congress Avenue Bridge. The new bridge design included expansion joints that inadvertently created roosting cavities for bats - tiny Mexican Free-tailed Bats - eventually one and one-half million of them! At first, many people perceived the legions of bats as a threat. But Merlin Tuttle, founder of Bat Conservation International, helped bring people around. Be sure to watch the video. In the early 1980s, the city of Austin, Texas needed to enlarge its Congress Avenue Bridge. The new bridge design included expansion joints one inch wide and 16 inches deep. The spaces between the joints inadvertently created roosting cavities for bats – tiny Mexican Free-tailed Bats – eventually one and one-half million of them! We simply began with community leaders and the media and it didn’t take long for the message to trickle down that these bats were among the safest, gentlest of animals and among the most valuable. …In more than 30 years since they first started moving in we’re still waiting for the first person to be attacked or harmed by a bat despite the fact that thousands of people watch them very closely each summer night. We now know that they’re eating 15 tons of insects every night including many of our state’s worst crop pests and they’re bringing in an estimated 12 million tourist dollars each summer through people visiting from all over the world to enjoy the spectacle. 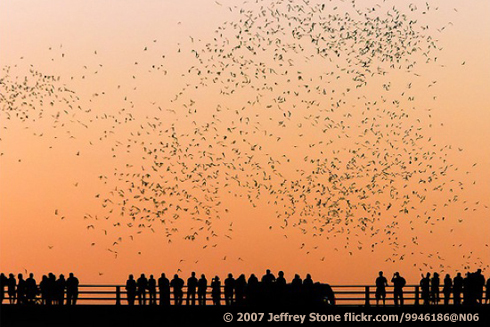 [From late March to early November], Visitors watch in awe each evening after sundown, as more than a million bats fly out from under the bridge. For links to learn more, start at birdnote.org. Sounds of Mexican Free-tailed Bats communicating – a range of their social calls – provided by Bat World http:// www.batworld.org/ from the CD “Bat Talk” recorded by Amanda Lollar and Barbara French. Special thanks to Bat Conservation International http://www.batcon.org/ for assistance. Ambient by Kessler Productions. Mexican Free-tailed Bats - Learn more!